Joe’s kitchen may look ordinary on the outside, or even you might totally missed it when you passed by the place at its location at Bukit Merah, just directly opposite Alexander Hospital. I did. Having passed by the area a few times, i didn’t know there was this hidden gem offering authentic thai food experience in our midst of our heartland. I was given this opportunity for the wonderful Makan experience organized by Leslie of ieatishootipost fame. A total of 47 food punters joined us on this occasion. Some of which were ieat’s old makan kakis, while many like me were first-timers joining ieat on his makan session. The interior of the place was simple, the place wasn’t very big but it managed to squeeze all 47 of us inside the place. I wondered how all of us managed to eat inside that night. Miracle! The event was supposed to start at 7pm, i got there around 645pm and there were people there already. Damien was the co-organizer for the outing. Jiawei and Shanice were the earliest there if i’m not wrong, i seated in the same table with them. Also on the same table as me were liverpool, eastcoastlife & hubby, yanti & friend. All of us had a wonderful time chatting taking photos, and savouring the food. The crowd starts to come in and by around 740pm or thereabouts almost everyone arrived. The menu was to be 14 dishes including some starters, mains, and desserts. All the dishes came in sampling tasting size so that we can have a bit of everything. The female boss, Jamie (chef Joe’s wife) is friendly and attended to us warmly. Crispy rice cake The Kao Dang Na Dang help to kick-start our makan session. Not commonly found in Singapore. the cripsy rice cake, was supposed to go together with the peanut sauce. I didn’t quite enjoy this appetizer as i found it to be way too dry for my liking. Prawn Cakes The Thot Man Goong or Prawn Cakes was nice to eat, it was crispy and the prawn taste is just right. As most of us waited quite long for everyone to turn up before the dishes to serve, by the time the mango salad came out everybody were famished. We literally “attacked” the salad, and it was until ieat told us to hold our horses, that the salad was supposed to eat together with the sticky rice and chicken which were not out yet then we realized that. Gai Yang (Grilled Chicken) The grilled chicken was quite good to be honest, everyone got a bite of it. Placing the mango salad and the chicken onto the sticky rice, the taste is very different from eating the three dishes separately. Grilled Pork Collar This was no doubt for me, the star of the show! 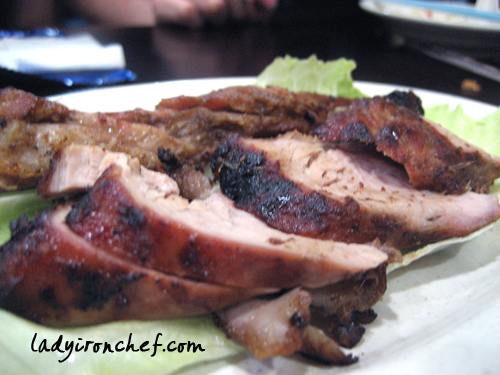 The Khaw Mu Yang, or grilled pork collar was somewhat similar to our Chinese char siew, albeit Thai style. Many of the kakis found it to be good too! 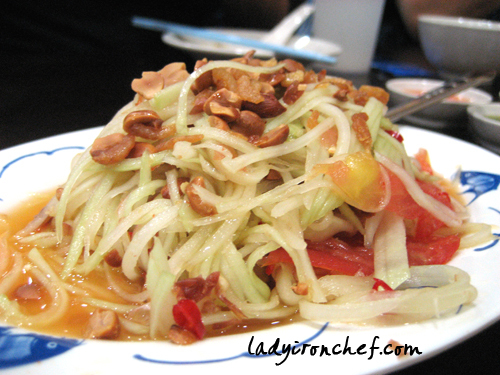 Its also commonly eaten together with the sticky rice and mango salad. But its so good that we eat it on its own. Tom Yum soup with fried fish In my personal opinion, how good a Thai restaurant is can be based on the test of their Tom Yum soup. Unquestionably. 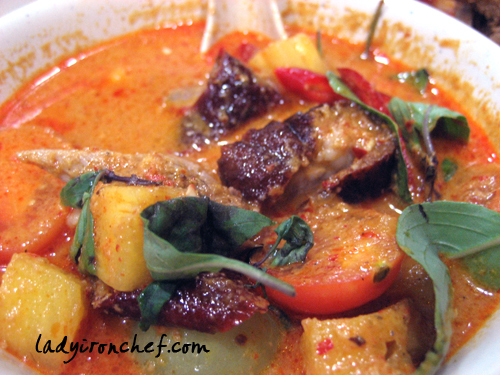 Tom Yum soup is the first thing that most people will think of when they think of Thai food. Well i say the Tom Yum soup by Chef Joe should passed with flying colours. The soup is really spicy, at least from my perspective. Dipping the crispy fried fish into the soup was quite a experience for me. Green curry beef The beef was tender, and immersed with the essence of the green curry. Deep fried Grouper with Thai chili The Thai chili was excellent here, real hot and a little sweet spicy. 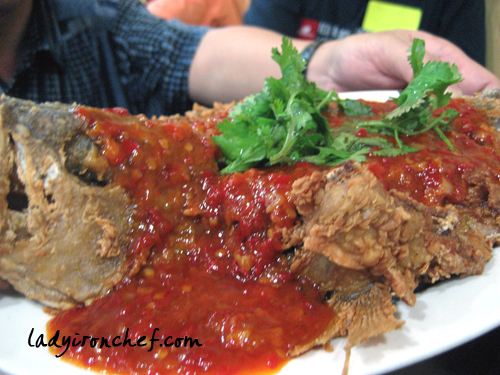 But i couldn’t help drinking more water so as to have a few more mouthful of the chili with the deep fried grouper. Red Curry Roasted Duck Having seen the green curry earlier, my first thought was red curry after green? This was followed by roasted duck curry? I have never heard of roasted duck curry, let alone tasting it. But this dish was really not bad, i’m not sure how the roasted duck came about, whether Chef Joe roasted the duck, or he brought it from elsewhere and cook it with the red curry, but nevertheless its good. And to our astonishment, there were grapes, yes grapes inside the curry! Talk about surprise, first roasted duck in curry, then grapes? Basil leave minced pork I was never a fan of minced pork in the first place, n’uff said! Claypot Crab Vermicelli with fatty pork Although the claypot crab was suppose to be the highlight here, but we got into eating the vermicelli instead. 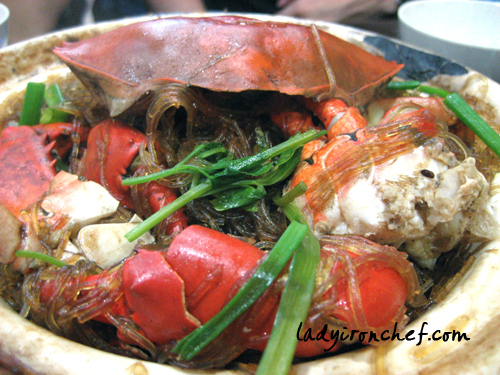 After cooking, the essence of the crab and fatty pork all went into the vermicelli, that alone should suffice for eating the vermicelli. Poom Fy Dang - Kang Kong Thai style Like all the other dishes in Joe’s Kitchen, the first taste was not very spicy, but the second bite was real hot. The Kang Kong got hotter with each bite, i suggested just swallow the veggies! Mango Stick rice To round off our authentic Thai food experience, we had Mango sticky rice, the mango was real sweet! Total Bill was $1646 for 47 people, $35 per head for the Authentic Thai food experience at Chef Joe’s place. I love going to Makan outings with big groups because we can get to know more people. Think Yebber Party @ MINT where there were about 50 people, the Social Media Breakfast with around 40 odds people, and now this ieat makan outing with 47 people. Credits to Leslie (ieat) and Damien whom organized this makan session for everyone to get together and enjoyed food. I looked forward to the many more outings organized by them, to meet more people and eat more food! The beauty of food, it can bring everyone from all ages, different backgrounds together, for one common purpose that is to savour all the good food. How often do you see strangers getting together and seating down for a meal? I’m going to organised LIC food event soon, do watch out for the post!